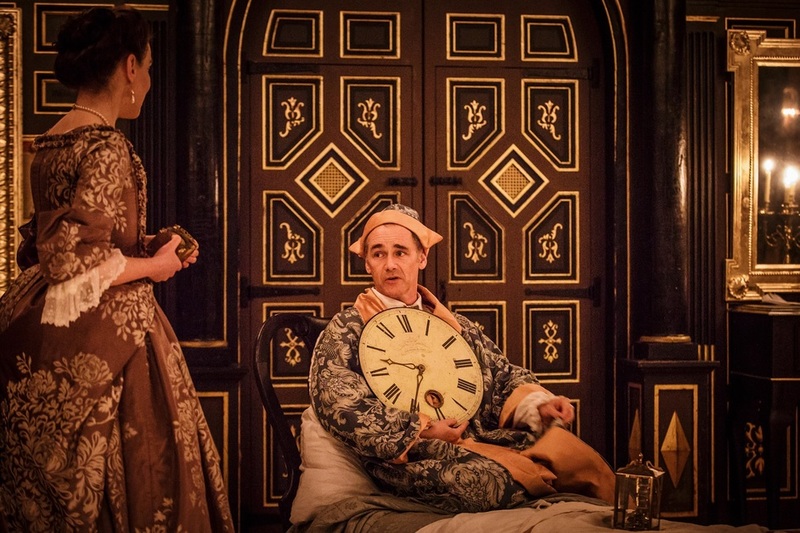 Wolf Hall actor Mark Rylance reprises the role of King Philippe V when Claire van Kampen's play Farinelli and the King transfers to the West End, transforming the Duke of York's Theatre into the Sam Wanamaker Playhouse with candles, on-stage seating and baroque musical instruments. Featuring a selection of arias first sung by Farinelli in the 18th century, the drama unfolds in 1730s Spain where Queen Isabella Farnese implores the world famous castrato to sing for her husband, the anguished monarch Philip V of Spain, in the hope that Farinelli's heavenly voice will lift the king's depression and insomnia. What are the best dining options near Farinelli and the King London? Farinelli and the King gyms, sporting activities, health & beauty and fitness. The best pubs near London Farinelli and the King. Farinelli and the King clubs, bars, cabaret nights, casinos and interesting nightlife. Where to have your meeting, conference, exhibition, private dining or training course near Farinelli and the King. From cheap budget hotels to luxury 5 star suites see our discounts for Duke of York's Theatre hotels, including Radisson Blu Edwardian Hampshire Hotel from 89% off.